At another time, Moses was instructed to chisel another two new stone tablets to receive the 10 commandments from God again. 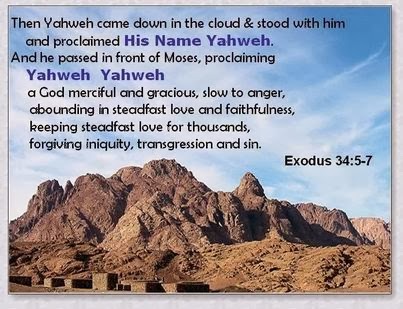 Yahweh God came down in the cloud and proclaimed "His NAME" in front of Moses. Can you see how God places tremendous importance on His SHEM. This time, what does God want to reveal about His SHEM? Can you now see how God strongly feels about His SHEM? He proclaims His SHEM to Moses again for the second time. This time He proclaims His SHEM twice in front of Moses. Whenever God says a name twice, He wants to say something EXTRA significant to grab our attention. This time, God repeats not a man’s name twice, but His own name twice. God is giving us important revelations of His nature and character. 1. Our human names have no revelation. 2. God’s SHEM Yahweh is self-revelatory. God's SHEM progressively reveals His Divine character: He is compassionate, gracious, slow to anger, abounding in love, faithfulness, maintaining love to thousands, forgiving, punishing sins. Our God is too wonderful for words. His deep character draws me to want to call on His Name in prayer more and more. I experience His compassion and everlasting love when I call on His Name Yahweh.